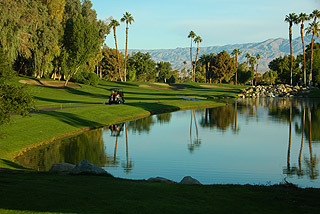 Formerly a private club, Woodhaven Country Club in PalmDesert is a beautiful 18-hole layout that is now open for public play. 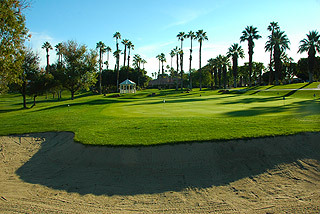 This wonderfully maintained layout provides golfers with an opportunity to experience private club amenities at public rates, which top out at under $100 prime season (including cart) in 2005/06. Tennis courts, racquetball, swimming pool, spa and a fully equipped fitness room combine with a spacious clubhouse to provide upscale amenities for club members. The public can enjoy the pro shop and restaurant/lounge plus banquet/outing facilities that can accommodate large and small groups. Locker rooms with showers are also on property. 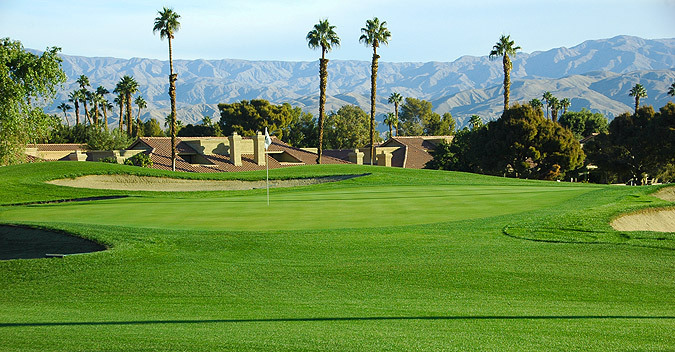 Breathtaking views of the surrounding mountains, sparkling lakes, water features and lush green fairways are prominent from these facilities. 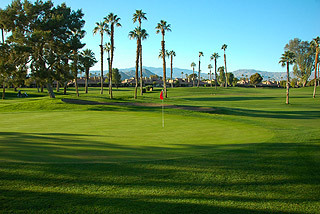 The golf facilities include three practice greens and a grass range. The golf course provides 3 sets of tees that play to distances and slopes measuring 5794 yards/118 slope, 5254 yards/118 slope for women and 4826 yards with a 112 slope from the forward sets. Though short in distance with only two holes longer than 400 yards in length, Woodhaven is an interesting layout that is fun to play. The water holes on the short par four 5th and par three 6th are quite beautiful, and require accuracy off the tee. The course plays along a mostly level terrain and the green complexes are only slightly raised, affording recovery and reasonable up and down opportunities. 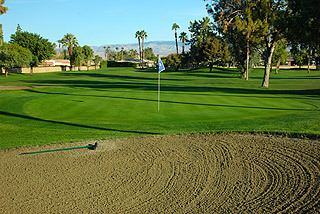 The putting surfaces are small in size with few undulations, but are frequently sloped from back to front. Bunkers usually line both sides, leaving the fronts open for low running and bump/run approach shots. 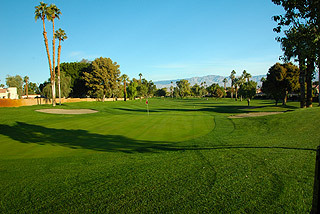 The tree lined fairways are quite generous with their landing areas, and as is the norm in the Palm Springs area, gorgeous mountain backdrops frame most green and tee complexes. 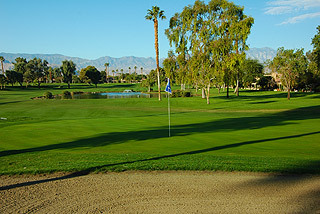 Woodhaven, as an open-to-the-public golf facility, is now the sister property to Cimarron, which features both a championship and short course, also in the Palm Springs area. For more info on Woodhaven Country Club, visit out page for the property, with direct link to their website by clicking here. 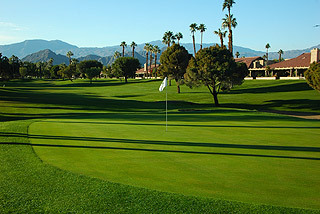 Palm Springs Golf - Copywrite©1999-2019. Two Guys Who Golf (1370041 Ontario Ltd.). All Rights Reserved. 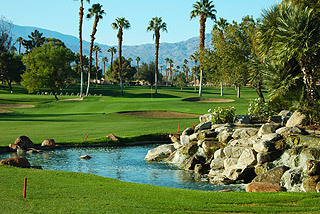 Information and reviews on Palm Springs golf courses, Palm Springs golf resorts & hotels, Palm Springs practice facilities and Palm Springs golf stores.